In October, 1347, a Genoese trading ship arrived at Messina in Sicily from the Black Sea Port of Caffa bringing a deadly cargo into Europe. Its crew of dead and dying sailors exhibited strange symptoms, marked by black swellings in the lymph glands of the armpits and groins, which oozed blood, boils and dark blotches on the skin, internal bleeding followed, death usually resulted within five days. The Black Death, one of the most deadly pandemics in human history wiped out around a third of the population of Europe, it is believed to have originated in China, from where the infection spread along major trade routes to Caffa, where Genoa had an established trading post. "Realizing what a deadly disaster had come to them, the people quickly drove the Italians from their city. But the disease remained, and soon death was everywhere. Fathers abandoned their sick sons. Lawyers refused to come and make out wills for the dying. Friars and nuns were left to care for the sick, and monasteries and convents were soon deserted, as they were stricken, too. Bodies were left in empty houses, and there was no one to give them a Christian burial." At Siena, Agnolo di Tura recorded:- "They died by the hundreds, both day and night, and all were thrown in . ditches and covered with earth. And as soon as those ditches were filled, more were dug. And I, Agnolo di Tura . buried my five children with my own hands . And so many died that all believed it was the end of the world." The disease mutated and began to be accompanied by other symptoms, instead of the swellings, or buboes, its victims suffered continual fever, headaches, spitting blood and death came even quicker. Bubonic Plague was now manifesting itself in two forms, the first, septicemic form, was transmitted by contact, infected the bloodstream, the second, the pneumonic form, which infected the victims lungs, was spread by respiratory infection. Victims suffered appallingly and before the end "Death was seen seated in the face". Bubonic plague, caused by the bacterium Yersinia pestis was transmitted to humans by the bite of fleas, the flea itself being infected by the black rat upon which it existed as a parasite. 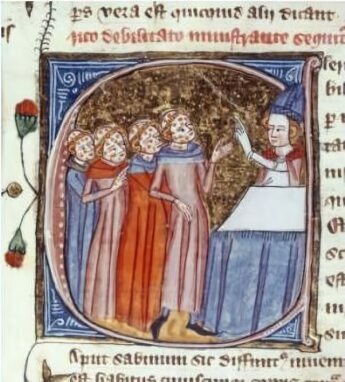 Both rats and fleas thrived in unsanitary conditions of the age, medieval medicine was powerless in the face of it. Its remorseless advance struck terror into the hearts of the medieval population of Europe. Many in that superstitious age interpreted the plague as a manifestation of the wrath of God on the sins of mankind, bent on assuaging divine anger, flagellants, groups of people did public penance, bare foot and in sackcloth, they scourged themselves in procession through the towns. In many places the Jews where made scapegoats for the rage and general feelings of powerlessness the pestilence evoked. The mortality rate was highest amongst the poor, but more famous victims included Alphonso XI of Castille, Queen Leonora of Aragon, Bonne of Luxemburg, the wife of the Dauphin of France, Queen Jeanne of Navarre, the historian Giovanni Villani, and Joanna of England, the daughter of Edward III, who died at Bordeaux, en route to Castille to join her betrothed, Pedro of Castille. Records are unclear as to precisely when the Black Death began to cast its deadly shadow over England, although it is known to have first occured the summer of 1348 in the West Country. Some contemporary sources name Bristol as the port of its entry into the country, while others state other locations in Dorset. The Grey Friar's Chronicle records "In this year 1348 in Melcombe, in the county of Dorset, a little before the feast of St. John the Baptist, two ships, one of them from Bristol came alongside. One of the sailors had brought with him from Gascony the seeds of the terrible pestilence and through him the men of that town of Melcombe were the first in England to be infected." It may have appeared in late June or possibly 4th August. Striking inland from the West Country ports, the plague had reached London by 1st November, where an estimated 30,000 of the city's population lost their lives. By the spring of 1349, it had penetrated Wales and the Midlands, in the late summer it had appeared in Ireland and by 1350, in Scotland. The Black Death had subsided its inexorable march through Britain by the close of 1350, in its aftermath came inevitable social upheaval. Parliament tried to legislate on the problem by introducing the Statute of Laborers in 1351, which attempted to fix prices and wages. The disease was never totally extinguished in England during the course of the next few hundred years, additional outbreaks occured in 1361-62, 1369, 1379-83, 1389-93, and in the first half of the fifteenth century. The Great Plague of London (1665- 1666) was a smaller epidemic of Bubonic Plague than the Medieval Black Death. There have been at least 3 major pandemics of Bubonic Plague and multiple epidemics in history. The first pandemic occurred during the fifth and sixth centuries spreading from the Middle East to the Mediterranean, wiping out an estimated 50% of the population in these areas. The second affected Europe between the 8th and 14th centuries, and was responsible for the deaths of nearly 40% of the population. The third pandemic began around 1855 in China. Bubonic Plague still exists in some areas of the world, there are reported to be 1,000 to 2,000 cases worldwide annually. Areas where the disease still occurs are located in Russia, the Middle East, China, Southwest and Southeast Asia, Madagascar, southern and eastern Africa, southwestern United States, the Andes mountains, and Brazil.